The other night, I was sitting at my desk, working while sick with a cold, and all of a sudden I thought to myself, "Self? 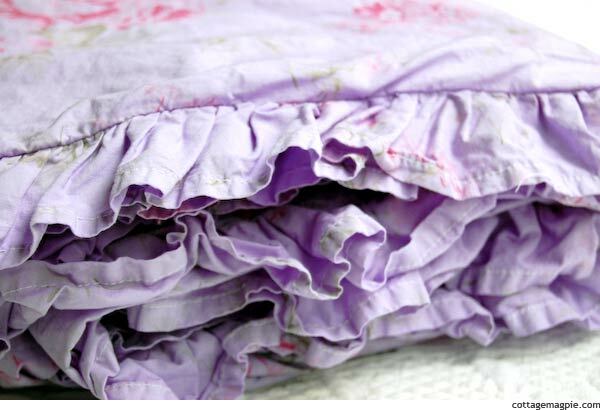 You should over dye those sheets for Baby Girl's room." Thanks to major hoarding tendencies a lucky coincidence, I just happened to have some RIT dye in the house that was close to the right color for my project. Late night me says, "Good enough!" Fifteen minutes later, I had newly over-dyed bedding in the wash, ready to rinse and dry for Baby Girl's new room. Like always, I'm trying to do this room on a budget. As in, as little money as physically possible! So I had planned to use this pretty white bedding with pink flowers I had gotten on eBay several years ago and didn't use. It's really pretty. But that much white for a small child I wasn't sure about. 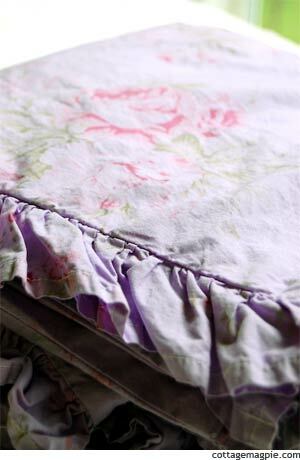 Plus she loved that room with the lilac ruffled duvet. So, over dye it is!! After dying, it looked like this! I love how the flowers are all faded under the dye. It's a little more purple than lilac, but I like it and I'm sure Baby Girl will, too. I saved some of the original bedding, too, so that I have some to mix and match. I think they look pretty together. I also really like how they look with the Sea Salt paint color we picked. But the best part? Of course, the ruffles! Ruffles, ruffles, ruffles. I'm really excited to see how these will work in her room. Now I just have to finish painting!! Have you guys tried to over dye anything? What are your favorite color combos?